"they will communicate with Mr. A. Blakeley, Minister of Home Affairs, by secret code". Phillip Taylor and Errol Coote arrived in Broken Hill on the afternoon of 20/07/30 and Coote, ever the journalist, could not resist being interviewed by the local scribes, he would have been well advised to have kept a low profile. The 'Barrier Miner' and the 'Barrier Daily Truth' reported the interview the following day and both newspapers mentioned coded communications. The Barrier Daily Truth wrote, "Arrangements have been made to send advice to Mr. Arthur Blakeley, Minister for Home Affairs, in code, of the result of the exploration, and, if successful, the Minister intends making arrangements to prevent ill-equipped parties rushing to the field with all its dangers from thirst, blacks and starvation". Considering the results of the Expedition, a nice piece of irony indeed. Apparently the coded communications would be transmitted using the Expeditions elaborate and expensive radio, but due to missing components and Lasseter's lack of knowledge of the machines operation, the radio could only receive and not transmit. So unravelling coded communications was not considered a problem....until the C.A.G.E. file was discovered in the National Archives. My initial reaction to the following telegram from Carrington to Blakeley was, 'what on earth does OWYASZYXEC FYLKUPEXOO mean?' 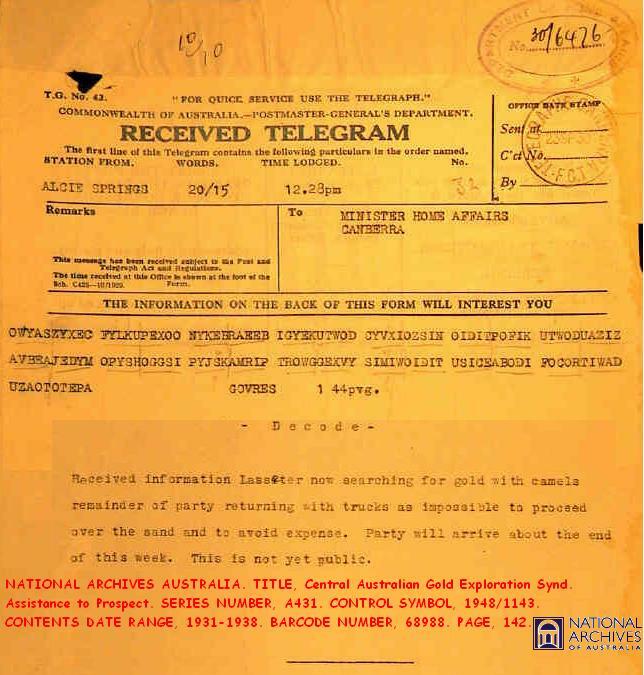 and how does one go about decoding a 1930's telegram?. I need not have worried, the Minister did not read code either. The above information was given to Vic Carrington by Fred Colson, the day after he returned to Alice Springs from Illbilla, Blakeley, Sutherland and Taylor returned on the following Sunday. Coote was grounded in Oodnadatta due to bad weather, when Ern Bailey, the company secretary of C.A.G.E. contacted him late the same day with the above information, and asked the pilot to take over the Company's affairs in Central Australia, his first priority to find Lasseter. Coote was only too pleased to take on the job, having fancied himself as management material since the beginning of the Expedition, but never acknowledging that he was also responsible in large part for it's failure. 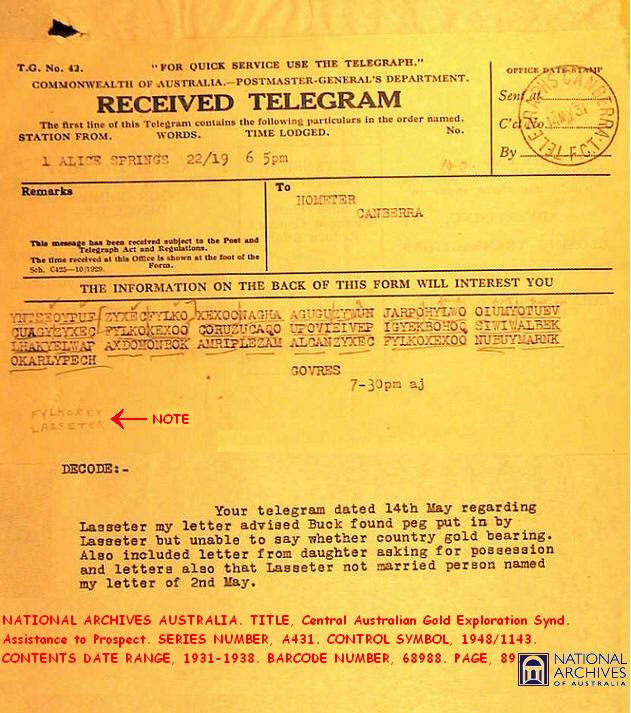 He arrived in Alice Springs the day after Carrington sent the telegram, the information in it now very public. Eight months later Carrington was again corresponding with Arthur Blakeley regarding matters Lasseter. Bob Buck had returned to Alice Springs with details of Lasseter's death and burial at Winters Glen in the Petermann Ranges, Carrington had suggested to Blakeley that four of the five letters found on Lasseter's body should be returned to the C.A.G.E. Company as Lasseter's employer and the 'Dear Rene' letter should be returned to his wife. Blakeley concurred and the letters were forwarded to C.A.G.E. and Mrs Irene Lasseter, he also made a press statement regarding Lasseter's demise in Central Australia and hopefully that was the end of the unhappy and embarrassing business. Unfortunately for Blakeley his press statement brought to light details of Lasseter's first marriage, from which he was not legally divorced. Lasseter's daughter from this marriage, Lillian, wrote to Carrington protesting the distribution of Lasseter's personal effects. Hence the above telegram and the beginnings of much correspondence, with no satisfactory conclusion in Lillian's favour. Note Lasseter's encoded name, FYLKOXEX, a code de plume so to speak. Barrier Miner, 21/07/30. Barrier Daily Truth, 21/07/30. NATIONAL ARCHIVES AUSTRALIA. Title, Central Australian Gold Exploration Synd. Assistance to Prospect. Series Number, A431. Control Symbol, 1948/1143. Barcode No, 68988.